Median listing values grew at a breakneck pace between March and April, with no signs of slowing. There are plenty of reasons besides the fantastic weather and booming tech industry that make San Francisco an ideal place to live. The capital city of California, named “America’s Most Diverse City” by Time magazine in 2002, has seen median list prices soar over 25 percent month-over-month. Total listings in Dallas are up, with median list prices also rising. Ready for a hot summer? Total listings and list prices are on the rise all over the country, and homes aren’t staying on the market for long. Making our way past spring and look at the 2016 housing market, here are 10 of the hottest real estate markets to watch for this season. Charlotte, North Carolina, continues its strong showing. Between median list prices being up 6.7 percent over last year and employment growing by almost 4 percent year-over-year in a city considered the United State’s second largest banking center, you’ve got a case that bodes well for a continued hot-streak in the home of the Carolina Panthers. A surge in job growth is fueling Atlanta’s prospects in the real estate market. Sellers know this, and they are taking advantage of the recent economic gains; non-farm employment is up 2.9 percent over last year, with median listing prices up 5 percent year-over-year and 11.9 percent in April over March.. Companies know Atlanta is a great place to do business, and the market suggests continued growth. Atlanta is a great place to do business, and the market suggests continued growth. 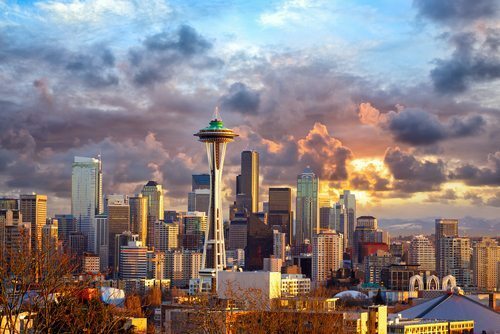 One of the most environmentally conscious cities in the world makes a strong case for a sizzling summer in the Pacific Northwest, with median list prices spiking 16 percent between March and April. Great urban development with a focus on sustainability makes this one of the most youthful and livable cities in America. The home of Microsoft and the birthplace of Amazon ranks No. 1 for combined job and wage growth in the country, which makes it a great place for young professionals to find jobs with great salaries. Month-to-month median list prices are up 13.7 percent in April, which is 4.3 percent better than the national average. Seattle is one of the country’s fastest growing cities of the past five years, and with a strong tech industry behind it, it seems growth will continue into 2017. Total listings in the city of Dallas are up 4.7 percent in April, with median list prices also up 17 percent over March. Job opportunities continue to increase, and with a strong economic and social backbone to support its growth, Dallas has what it takes to stay hot through the summer. The capital city of California, named “America’s Most Diverse City” by Time magazine in 2002, has seen median list prices soar 25.6 percent from March to April. It’s robust healthcare and medical industry, as well as its place in California’s university system, make it a market primed for continued growth. Existing home sales are up 11.1 percent in March in the Northeast. Boston, one of the world’s leaders in innovation, brings with it plenty of economic opportunity and a billing as one of America’s most livable cities, even with its high cost of living. Located close to beautiful coastline, hiking, national parks and great sports teams, Boston’s got a lot going for it, and summer is the perfect time for the market to stay hot. The Show-Me State’s easternmost city will have a busy summer. Month-to-month median list prices are up 6.4 percent. With homes selling 12 days faster than the national average, you’ve got a recipe for a market heating up at just the right time. With homes selling 12 days faster than the national average, St. Louis will be hot. It doesn’t hurt that St. Louis has great museums, a fantastic zoo and strong sports following, which brings it all together with its manufacturing and healthcare industries. Denver, home to the Super Bowl Champion Broncos and all things outdoors, makes a strong showing for summer 2016. Total listings are up 2.1 percent month-over-month in April (12.3 percent year-over-year), and unemployment is down to just 3.3 percent. There’s plenty to do, and plenty of opportunity for growth, which makes this market a fantastic place for young people and families alike. Overall, median list prices are up 17 percent from March to April. With unemployment up 3.3 percent in March, San Francisco looks to remain the hottest real estate market in the country through the summer and into the fall. Kyle Draper is the president and co-founder of AgentImpress.me. Connect with him on LinkedIn or follow him on Instagram.